AstraZeneca is joining the growing list of pharmaceutical companies embracing the use of digital health technology to improve the effectiveness of their asthma medications through a recent partnership with Adherium. This trend is one we’ve seen already in pulmonary disease with Propeller Health’s inhaler attachment for medication tracking (GSK, Boehringer Ingelheim), coronary artery disease with Vida’s digital health coaching services(AstraZeneca), and potentially soon in heart failure with soon-to-be blockbuster Entresto (Novartis). 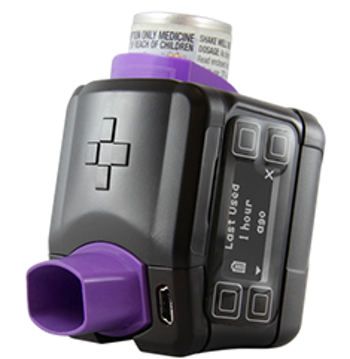 Adherium is an Australian company that makes a line of FDA cleared smart inhaler attachments that attach to a range of inhalers for asthma and chronic obstructive pulmonary disease (COPD). These devices, which include a touchscreen display for management, track the date & time of medication usage. Users can also set alerts to remind them to take their medication. Data collected by these devices can be transmitted to a paired smartphone via Bluetooth; that data can then be reviewed in the app. For users without a smartphone, data can be transmitted via a home health hub or by directly connecting to a computer. Missing doses of controller medications and increased use of rescue medications will trigger alerts for further intervention. What’s really unique and interesting about Adherium, in comparison to many digital health companies, is that they have some evidence to back up the big claims they make about improving asthma management. In a study published earlier this year, Adherium’s SmartInhaler was tested in a group of pediatric patients who came to the ER for an asthma exacerbation. The control arm got a SmartInhaler alone and the intervention arm got a SmartInhaler with their active tracking & reminder system. Adherence to therapy went up from 30% to 80% with this intervention; there was also a greater improvement in asthma morbidity scores. As C. Everett Koop famously said, “drugs don’t work in patients who don’t take them.” Medication non-adherence is a complex, multifactorial problem; management resources like Adherium address one part of the problem by supporting patients with tools to help them manage their medications. It’ll be important that we, as a system, work on the issues of access and patient education in parallel. But tools like these could help us make a pretty big dent in this important problem.